Welcome to the 2019 edition of Deloitte’s predictions for the real estate industry. Curious to see which changes lie ahead? Discover the Real Estate trends for 2019 that will impact your business. Read about circularity , blockchain,cybersecurity, and more. The Real Estate and Construction market has been changing over the past few years. 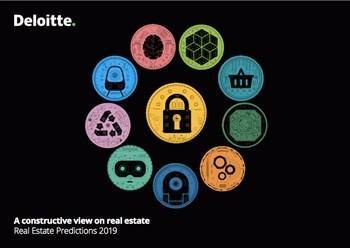 With all these changes going on, Deloitte Real Estate is releasing the Real Estate Predictions 2019. We hope the predictions enhance your understanding of the opportunities within the real estate industry. Have an interesting read!